Just a note to say this will be my last post of 2005. I will return on the 2nd, and will have the Emperor's Cup Final (Urawa Reds vs Shimizu S-Pulse) report. As well as anything else that comes up. One of my favorite aspects of the Japanese New Year is the ringing of the temple bell, called Joya no Kane. The ringing is started at midnight. Ringing the bell at a temple on New Year's Eve is a Buddhist tradition. Bells are rung 108 times in that according to Buddhism it is said that man has 108 troublesome desires, and by hearing the bells toll 108 times people can cleanse themselves of such desires at the end of the year. Instead of screaming and making loud noise, the typical Japanese New Year's is more hushed and characterized by the deep bong bong bong of the temple bell as it is slowly rung. Of course, being the "Land of the Rising Sun", getting a glimpse of the First Dawn is also a beautiful way to start the year. If you are a kid, you also luck out by receiving little decorated envelopes of cash called otoshidama. Depending on how old you are, and how generous the people giving the envelopes to you are, the amount is up to the giver (the best givers are of course grandparents)... and can vary greatly. As a child it was quite the thing to look forward to and a great motivator of visiting older relatives. Of course, now as an adult I am in the position of having to give them out! P.S. Year of the Dog. Thursday afternoon's semi-finals turned out to be very close games that stretched into extended time. (photo from Sponichi Annex)The tragedy continues for Cerezo. This close to a chance at a title, and they let it slip, again. After some dynamic goals against opponents like Jef Chiba and Gamba Osaka that allowed them entrance to today's round, Cerezo just could not find a way in past a much more defensive Shimizu side. Shimizu played to their strengths, and it wasn't suprising that they won this with a 1-0 scoreline and a goal from Jae Jin Cho during extended time. Following their Club Youth victory in the Sahara Cup last week >>read entry, this must be a very happy season for S-Pulse! The score at 90 minutes was 2-2, Omiya equalizing in the very last minute before the second half ended. But that second goal for Omiya (by Tomita) was the last that the Squirrels could muster. In the first half of the extended period, Reds were able to get two and proceed to the historic finals that takes place on New Year's day. With the recent national team roster call-up announcement, first time call-up 21 yr old Makoto Hasebe (Urawa) probably got a lot of attention this afternoon by the media. He scored two goals today, and I can already see the headlines for tomorrow morning's sports papers... If you are curious as to what he looks and sounds like, here is a video stream of a post-game interview. (Rough Translation) In the video interview above, Hasebe says that they "will go after the win for the title and an eye on the ticket to the ACL. We haven't really analyzed the next opponent (Shimizu) yet, but our current defense line is quite stable and the key will be how effectively we can attack. I hadn't been directly involved in many goals recently, so the goals today have increased the level of my confidence and ambition. (Shimizu) seems like a very tough defensive team, and in that they may be similar to our opponents today (Omiya). We want to play our style of football, and come out with the victory. On the pitch, I tried not to be too self-conscious of the attention I am getting (following the national team call-up), but of course I wanted to play as someone who is worthy of representing the nation, take that as my responsibility and source of pride. But I still think I have many areas of improvement, and I want to decrease the number of small errors. I want to improve the quality of my performance for the New Year's day game, and then after during the national team training camp." Kotatsu (pic): a very neat little concept. A low table that is covered by a quilt, and has a heating device on the underside of the tabletop so you can tuck your legs and hands inside the table and keep warm. Very cozy, and it tends to make you sleepy. Mikan: tangerines, a seasonal must in Japan. Get your vitamin C, and hydrate yourself in the dry climate. The thing I love about mikan is that the skins come off as easily as peeling a banana. Noodles: in Japan, eating noodles ("soba") on New Years is also one of the traditions (of which, you can imagine, we have many). Noodles represent long life -- because...they are long... Hmmm. Rather simplistic symbolism, but there you go. An old Japanese saying: directly translated "Even when a dog walks, he will hit a stick." Has both positive and negative meaning revolving around the theme of action and consequences. You cause some kind of action and it will result in some kind of consequence. It has been a really interesting year. When I first started this blog back in February, my take on it was that of a person trekking out into the middle of the desert and digging a hole just for the fun of it. Kinda pointless, kind of a personal challenge, and not bothering anyone. If you check out >>my very first entry, you'll see I said something to that effect. But it turned out to be nothing like I expected. I ended up not in this vacuum of the internet where I affected nothing and nothing affected me. Instead, I have been motivated and inspired by not only the football I've watched but also the voices of the people (football fans) who have shared their thoughts with me. And I am grateful to those people who have contacted me over the past year with comments and questions, keeping me on my toes. The blog also allowed me to "meet" a lot of good people, football writers and football fans as well as fellow bloggers. I have also had my share of not-so-nice experiences as well. But I chalk it up to lessons well learned. 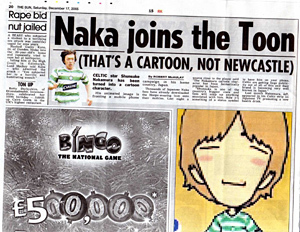 One of the things I think that struck me most was the unavailability of much Japanese football news in English (or any non-Japanese language). Not big news about the big stars, but the day to day kind of intelligent discussions that makes following football seductive, especially if you don't have access to full games. Of course, this is quite understandable. Not that many people in the world really care or know about football in this country, and part of my initial motivation for starting this blog was to bring a wide range of current topics to people who are curious. The trickiest part for me has been the translations. Which is why I have prefaced the direct quotes I've personally translated with "rough translation". It is something I want to underline a hundred times, not just when people read what I personally have translated, but also when you read any translations. Believe me, I've seen some extremely shoddy translating on a wide range of media -- both in and outside Japan, on tv and in print. Along with translating the meaning word by word, the problem lies in the context of the comment as well as cultural context. And sometimes you will have people being quoted for saying things they didn't even say. To be honest, I have been rather unimpressed with the cavalier attitude with which many professional writers have used translations and quotes in sports (especially in football, where many countries are represented even inside one club) -- as many of you speak more than one language, you probably know what I mean. Having struggled with this issue throughout the year myself, I was saddened when recently one of Japan's most famous baseball players, Ichiro Suzuki (Seattle Mariners) was the victim of exactly this kind of foggy interpretation. As you can see, once it's "out there", you can't stop the bleeding. The P-I tried to defend their unquestionable error by saying they were justified in "reading between the lines" of the article. But as you can see the original author/interviewer has claimed those nuances as his own bias (how he saw the season and Ichiro's position in the team).... and you can go on and on, around and around. For a while there, the city of Seattle turned on one of their most loved athletes... backlash is that easy. I guess it's just something to keep in mind especially if you read a quote translation that sounds out of character. First be skeptical, is what I learned. But this is not to say we should stop trying to understand cross-culturally. No indeed. What fun would that be? That is, afterall, why I started the blog in the first place. I'm just learning as I go along. I hope you continue to join me next year. We have lots and lots coming up -- the J league season with three newly promoted teams, more transfers in the works, the Asian Champions League, the Japanese players in the European leagues, the Asia Cup qualifiers, and the gem of it all: the World Cup! But first in the next four days, we have the Emperor's Cup Semis and Finals. Oh, and my New Year's Resolutions to come. If you have suggestions, gripes, comments, and questions about the blog, now is the time to tell me! The JFA announced the 22 member list for the National Team's January-February training camp and friendly with the US. Kubo is back after almost a year and half away due to continuing injuries to his back and legs. The Dragon is back! Newcomers: Urawa's defensive midfielder Makoto Hasebe and Sanfrecce's goal-getter Hisato Sato. Sato is the top scorer in the J-league this year among Japanese players. Hasebe plays a defensive midfield position at Urawa, but is also able to (or at least desires to) become a play-maker. Nagoya GK Narazaki was hurt in the last round league game. Gamba forward Oguro had a slight injury scare during the taping of a tv variety show last week (twisted his ankle trampoline-ing into a wall). FC Tokyo defensive midfielder Konno is also injured. The Europe-based players have not been called because they are currently in the midst of their league season. January 29: The team undergoes strenuous endurance and physical training for a week under Satouchi's whip. February 5: The team flies to California. February 10: Game against the US National team in San Francisco. It was a busy weekend, and the Emperor's Cup quarter-finals sort of went by in a blur. I had thought this last opportunity for a title would get the teams remaining to put on more of a stubborn fight, but the games all finished without any nail-biting PKs. Some teams just didn't have that extra "something" to pull themselves out of a tough situation, and other teams had the momentum. SportsNavi has included video highlights streams from the game, so I've posted the links below. You may have trouble getting uninterrupted streaming if the demand is high, but maybe try the links again in a day or two. This last Osaka Derby of the year (I think it was the fifth time these two teams met this year) ended with an unquestionable first victory for Cerezo. Giving away 3 goals is not outside the scope of a Gamba game, but usually they have the firepower to get more goals than they give up. Unfortunately, against a full-strength Cerezo chomping at the bit to finally stamp their foot down and get a win over the league champs, Gamba had little in its reserves. Cerezo were very strong. The team was effectively thinking as a unit, and their style and aims were very clear. The most inspiring thing about the way Cerezo played was the dynamism with which their front players ran towards the goal when they got possession. With players coming at them at full speed, the Gamba 3-back line was pulled apart, not knowing who to cover on the cross. Gamba on the other hand, without Araujo and Oguro, had tried to play their style of football relying on individual talent to create inroads, but lacked the finishing creativity and depth. The weakness of a team that has relied heavily on individual skill when they suddenly lose two of their top scoring players. What hurt Gamba was also that Cerezo put on such a quick threat when they won the ball back, that the players in the back half of midfield, like Endo, who usually play a big role on the offense, could not seem to find good timing to go up and join the attack. Gamba were also a little unlucky on a couple shots, a free kick by Endo hitting the bar, among some other close calls. But overall, watching as a third-party spectator, I was won over by the Cerezo play. And in particular, the importance of Cerezo's veteran stars like Morishima and Nishizawa were a big part of their unity and strength. Nishizawa looked like he was ready to keel over from exhaustion towards the end, but for most of the game he showed why he was still such a key player. His ability to keep the ball, not get pulled down by defenders, it was a great example of some of the fighting spirit we would like to see throughout the J-league next season. 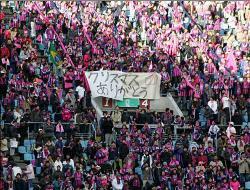 The photo above, from J's Goal, is of the Cerezo supporters thanking the team for a great Xmas present (the win). Going into the match the comment coming from the Omiya camp was "Even if we defend for 99% of the game, if we can just get that 1% chance. That is our hope." But actually, Kashima were caught on the back foot several times in the first fifteen minutes of the game, with some amazing dribbling by Omiya players like Sakurai, and even sideback Nishimura (boy, could he dribble! ), the Orange were this close to scoring very early in the game. But Kashima regained control, and the game for the most part was Kashima's to win. Unfortunately, it was the same old same old case of The Finish. While Omiya's Morita got through and converted on a sole run past the defense for their one "1% chance" goal, Kashima could not find the back of the net once. Not once. Sigh. To add insult to injury, Ogasawara was given his second yellow of the game was expelled from the pitch in the final minutes. This finishing has been Kashima's problem for a number of years now, and it will be interesting to see whether the new manager of Kashima will be able to do something about it next season. Congratulations to Omiya Ardija! They played smart, to their strengths. They knew Antlers would be gunning to come forward, and their simple and dynamic counters were effective and speedy in this game. Very nicely done. Sorry for lack of posts in the past few days. I had to give back the computer I was borrowing. Have ordered a new computer and it should be arriving some time this week. Yes! Finally my new baby is coming... At which point I shall be able to get back to properly posting again. The year is coming to an end, and I'd like to start the 2005 Thank You process with a tribute to the supporters of the J league. For those of you who don't normally get to see Japanese club supporters in action, here is a great collection of all 18 J1 club supporters doing their various chants and songs. Some footage was taken at away games, so you don't get the full impact of the home game crowds, but it's still a lot of fun to see and hear. The order is in the order of the final J1 rankings result this year, from bottom of the table to top (Vissel Kobe up to champions Gamba Osaka last). 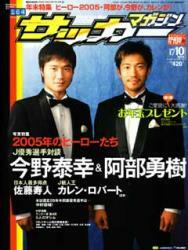 >>Click to see Japan football video search at YouTube Includes best goals of 2005, compilation vides of Nakata and Nakamura, goal from Angola game, and some misc.